Hello. I'm Robyn Steiner, Owner of Mathnasium of Vaughan, your neighbourhood math-only learning centre. We help kids in grades 1 - 12 understand math by teaching the way that makes sense to them. We are located in the Longo's plaza, on the North East corner of Jane and Major Mackenzie Drive. We are at the east end of the plaza, and there is ample parking in front. Call us today at (905) 303-2223 for a RISK FREE Assessment! My kids really love coming to class every week. I have seen an improvement in their grades. The place has very nice vibe and the kids dont get bored. They are motivated to do well. Our daughter has made such significant improvements in math since attending Mathnasium. Not only does she work on skills needed for her grade, but the math instructors also help her prepare for upcoming quizzes and tests. We are very happy with the progress our daughter has made! Pleasant and courteous staff, very accommodating and very helpful. I would definitely recommend. My child had a great learning experience. Was very happy with the service they provided and the professional attitude they all have. Really know how to get through to the teenage students. Great friendly staff. Instructors take their time with each of the students. Having my child here has helped with her confidence in math. 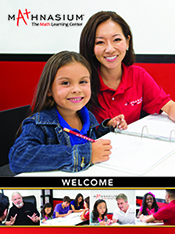 The team at Mathnasium (Vaughan) is professional and attentive to students needs. My daughter’s confidence and skills in math improved through attending sessions at Mathnasium. Mathnasium is a great tutoring centre to further strengthen your mathematical abilities. I have been attending Mathnasium for five years now, and it has always encouraged student success. It is dedicated in enforcing its students' understanding on math concepts The instructors are very friendly and interactive with students, always willing to provide assistance with one's learning . Mathnasium also has an enjoyable system of events to not only motivate students to consistently work diligently, but to have fun as well. The events are comprised of monthly challenges in which students will be put on a team to earn points, weekly popcorn days, weekly themes and more. Mathnasium offers work that corresponds to their students' work in school and teaches easy-to-learn strategies for students to use. I am always excited to go to Mathnasium during the week because I get to learn new things. The centre has a "welcoming" feeling to it which makes me feel comfortable and happy. You get to surround yourself with other students and tutors which builds close bonds. We are really happy with the help our son has been getting and yes I would recommend your services anytime and already have. My 11 years old son, loves math after starting Mathnasium. Now it’s one of his weekly routines to go to Mathnasium. He loves the staff and teachers and also he loves when it’s popcorn day or he gets stars and he is very motivated to continue on math. The best of all is that he is on top of his classmates standards and that makes him very much proud and confident. All in all , it’s a hundred percent recommendation on my behalf to start and to stick with Mathnasium. Everyone gets benefit and everyone happy. Sarah had a great experience. Friendly staff ! Signed up my daughter based on a referral and I would totally recommend Mathnasium. Staff is super knowledgeable, friendly, patient and welcoming. My daughter finds it very helpful. My son went up 12% on his final grade 12 math course in after just 2 months at Mathnasium!!!!!! We love that all the work is done at the centre. Kids are rewarded nicely for their work. Teachers meet kids where they are at but also provide some enrichment. Our kids look forward to going every week! Great place! The tutors are amazing! Awesome all around! Our son loves it there. His confidence in math would not have improved without Mathenasium. Thanks team. Accessible location. Very supportive staff. Great online booking system. Very systematic way of tracking students performance. Lesson times match our needs. The instructors are energetic and kind which counts for a lot with kids who may struggle with asking for help due to insecurity or feeling rushed by their school teacher. The Vaughan location provides a quiet, supportive atmosphere dedicated to learning. I found that Mathnasium was more equipped to accommodate individual student needs compared to two other tutoring businesses that I researched and attended orientation for. Everyone at this centre is helpful and knowledgable. I can see a great change in my child after her enrollment in just few months. Thanks mathnasium. Flexible time is so important for me, and also cancelation and rescheduling is so easy and comfortable. I can match my work with the time of classes. Tutors are excellent and patient. Individual program is a tool for success. My Daughter is very comfortable at your facility, her marks have improved. My son was able to learn more how to solve problems easily. Staffs are great. Adam has been a great tutor for Laura. Very helpful and explains very well. Thank you. The team has been very helpful and committed to my child. Thank you! Staff and teachers are great. Great environment in which to learn. Interesting approach to filling in math gaps. The kids like to go to Mathnasium, with no arguments! My son enjoys going to Mathnasium and I see big improvement since. Without mathnasium he would not be able to get A's in Math. He loves the friendly staff and always gets motivated with the amazing prices Mathnasium have. The progress report helps us know how well he's doing. Homework help comes in handy too. Robin is quick with any questions we have and very accomodating.Thank you Mathnasium in helping my son have a great learning experience. We have seen tremendous improvement with our daughter's math mark since she has started working with the Mathnasium team! I believe Mathnasium does its best to strengthen students' math skills, and hopefully create enjoyment while doing it. One of my boys feel struggled during some of the lessons and hope his time at Mathnasium doesn't become too stressful. Otherwise, the place is great; location, the staff, the atmosphere and mood. My daughter has become more confident with doing math. Her math grades have improved. Very happy with her progress. Staff are very approachable and helpful. They are super fun and circulate the room to help all students. Staff have great ideas and approaches in teaching math lessons. Our son has improved so much since he has started. He is getting 90's on math tests!! His confidence in math has increased so much!! Thank you. I never thought it could be possible. My son used to hate math and now he says he is goid at it!! We had a wonderful and positive experience at Mathnasium. My daughter's confidence increased because of this program. The teacher's provided a positive experience for her. My son is happy with the learning environment and has improved in various areas which he previously had trouble with. He now feels confident with his math skills and will start grade 10 math in his second semester. Katrina, was professional and efficient at allowing my son, Simon to be part of the group immediately.. And more importantly, pairing him up with two tutors that worked well with him on compatible level and professional level.. Outstanding facility..
my daughter's confidence level regarding math is increasing! Mathnasium Ranked # 1/Opens 1,000th Centre!